Following the local elections on 3 May, Eastleigh Borough Council now has five fewer women members. By reducing the total number of councillors from 44 to 39, the Lib Dems have effectively kicked five women off the council. The outgoing council had 25 men, and 19 women (43%). The new council still has 25 men, but only 14 women (36%). The minority Tories and Independents are more balanced with three men and four women between them. So the blame for this backward step in women's representation lies firmly with the Lib Dems. With so many safe seats for the Lib Dems they could have selected a gender balanced slate of candidates. Instead we end up with 22 Lib Dem men and 10 women (31%). This is an embarrassing state of affairs for a party which claims to want to "increase the representation of women in every aspect of life". Things are slightly better at the Hedge End West End and Botley Local Area Committee with five women out of 12 councillors (42%). Perhaps there just aren't enough women who want to put themselves forward. In the five HEWEB wards, Labour and Tories could only muster six women candidates between them. 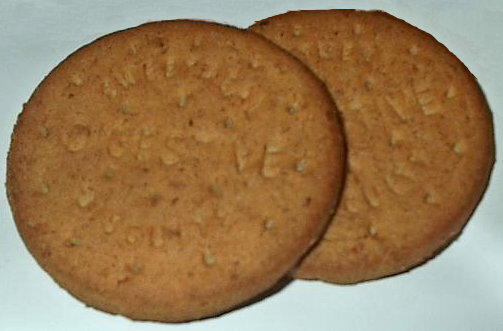 However, the make up of the Lib Dem cabinet is revealing. This is the decision making committee for the borough council. Even before the comprehensive defeat of Cllr Anne Winstanley last Thursday there were only two women cabinet members out of eight (25%). There has to be a change in the make-up of cabinet. Why not a full reshuffle? It remains to be seen if Cllr Keith House and his Eastleigh Lib Dem aristocracy can take this opportunity to achieve true gender balance on this vital committee. Do Eastleigh Lib Dems really save you money? The pro-austerity Lib Dems claim in Eastleigh that they save council tax payers money by restricting increases in council tax to rises at or below inflation. But does that really mean residents of Eastleigh Borough Council are better off? One way Eastleigh Borough Council has saved money in recent years is by transferring services and maintenance of public amenities to compliant parish and town councils. The Borough can take those costs off their books, but what impact has it had on the parish and town council component of council tax? In West End, the parish council charged a band D property £67.74 in 2007/2008. In 2017/2018 that has risen to £85.26 - an increase of 26%. In the same period the Botley Parish Council precept rose from £88.19 to £106.42 - an increase of 21%. Even Lib Dem dominated Hedge End Town Council increased its charge by 7% in the last ten years. Secondly, there have been massive increases in other charges and fees under the Lib Dems. In 2007 you could park all day at Itchen Valley Country Park for £1.50. In 2017 the Lib Dems charge you £4.00 - an increase of 167%. If you just want to park for an hour to walk your dog, the parking charge has gone up 120% from 50p to £1.10. Even a year's season ticket for parking has gone up 79% to £42.50. Parking charges at Hedge End Railway Station were introduced in 2007 at £2.00. In ten years Lib Dems have increased all day parking at the station to £3.50 - up 75%. The charge for collection of bulky waste items such as mattresses and furniture started at £26 in 2007. In 2017 you have to pay at least £54 - an increase of 108%. In the same period the minimum charge for garden waste collection rose from £19 to £36 - up 90%. Pest control charges have gone up by 23% for wasps, 90% for rats and 140% for mice. 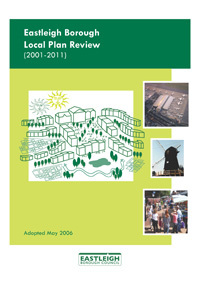 "Planning obligations, also known as Section 106 agreements (based on that section of The 1990 Town & Country Planning Act) are private agreements made between local authorities and developers and can be attached to a planning permission to make acceptable development which would otherwise be unacceptable in planning terms." £105,000 from Linden Homes for new children's playgrounds in West End. This hardly seems a sustainable policy as the council tax freeze is partly paid for by endless housing development. Local Lib Dems have cut the number of council meetings held in public and cut the number of democratic scrutiny panels. This means more decisions are made behind closed doors. The council must put more information in the public domain so that voters can scrutinise decisions with all the facts. I have submitted a freedom of information request calling on the council to make public whether the debt they have incurred buying assets like the Ageas Bowl hotel is really offset by rental income. It asks for information about all council assets in Hedge End, West End and Botley. Did you know that in 2014 the Lib Dems diverted 360 thousand pounds of public money from the Moorgreen Meadows public nature reserve in Tollbar Way to the private boxing club at the Ageas Bowl? Please use the comments facility of this blog or email me at hedgeendblogger@gmail.com if you have any questions about this post. 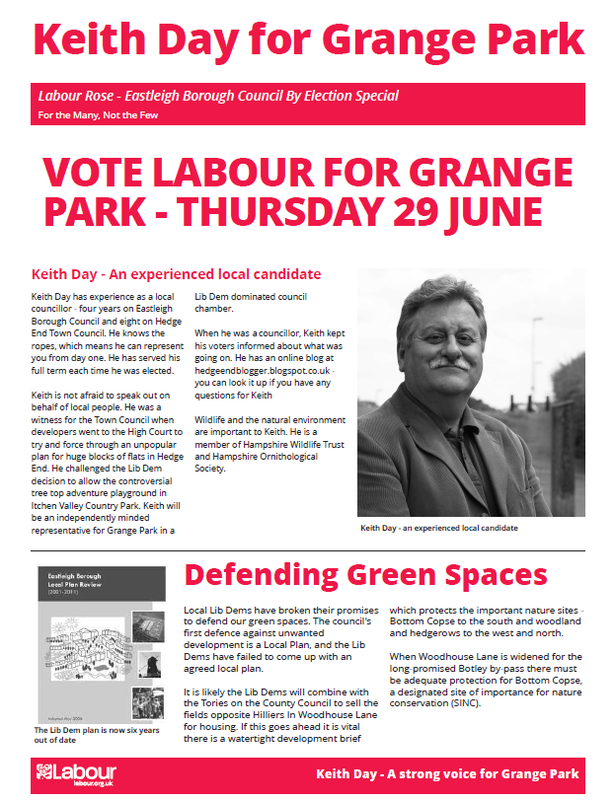 Why vote Labour in Grange Park? However you voted in the snap general election, your choice is different this time. The Lib Dems have an unassailable majority in the council chamber. There is no need to vote Lib Dem or Tory to keep the other side out in a by election. You can vote for the party you really support. Seven years of Lib Dem and Tory rule have seen unprecedented cuts to our public services: NHS, police numbers, social care. Our public transport and roads are crumbling. We need to start rebuilding, and Labour has the answers and the leader. With your support I can start the fight locally to oppose the ideological austerity which has failed to address the deficit and the debt. The Conservatives are weak and wobbly with a lame duck leader. The Lib Dems are leaderless and rudderless. Polling shows that Labour has continued to win support since the general election result. In Eastleigh, the Lib Dems stood still. Only Labour improved its vote share in line with the Tories. I will be posting soon about why we need proper honesty and transparency from our council, but in the meantime if you live in Grange Park and have any questions, do use the comments facility of this blog or email me at hedgeendblogger@gmail.com. Who will defend Hedge End's green spaces? "Local Lib Dems have broken their promises to defend our green spaces. The council's first defence against unwanted development is a Local Plan, and the Lib Dems have failed to come up with an agreed local plan. It is likely the Lib Dems will combine with the Tories on the County Council to sell the fields opposite Hilliers in Woodhouse Lane for housing. If this goes ahead it is vital there is a watertight development brief which protects the important nature sites- Bottom Copse to the south and woodland and hedgerows to the west and north. When Woodhouse Lane is widened for the long-promised Botley by-pass there must be adequate protection for Bottom Copse, a designated site of importance for nature conservation (SINC)." In the coming days I will explain a little more about why it is OK to vote Labour in Hedge End and why we need proper honesty and transparency from our council, but in the meantime if you live in Grange Park and have any questions, do use the comments facility of this blog or email me at hedgeendblogger@gmail.com. Why am I standing in the by election? "Keith Day has experience as a local councillor - four years on Eastleigh Borough Council and eight on Hedge End Town Council. He knows the ropes, which means he can represent you from day one. He has served his full term each time he was elected. Keith is not afraid to speak out on behalf of local people. He was a witness for the Town Council when developers went to the High Court to try and force through an unpopular plan for huge blocks of flats in Hedge End. He challenged the Lib Dem decision to allow the controversial tree top adventure playground in Itchen Valley Country Park. Keith will be an independently minded representative for Grange Park in a Lib Dem dominated council chamber. When he was a councillor, Keith kept his voters informed about what was going on. He has an online blog at hedgeendblogger.blogspot.co.uk - you can look it up if you have any questions for Keith. Wildlife and the natural environment are important to Keith. He is a member of Hampshire Wildlife Trust and Hampshire Ornithological Trust". Tomorrow I will explain a little more about why I think the Lib Dems have failed to keep their promises about defending our green spaces, but in the meantime if you live in Grange Park and have any questions, do use the comments facility of this blog or email me at hedgeendblogger@gmail.com. Blogging occasionally about local politics and things that happen in Hedge End. You can email me at hedgeendblogger@gmail.com Follow me on Twitter @HEWEBLabour or Find me on Facebook.